After spending four years in Waco while attending Baylor University, I watched it grow from a fast-food filled college town, to one of the top tourist destinations in the country. And while there is something to be said about the Silos, Magnolia Table, Common Grounds and the other stops along the Waco tour bus, I’m here to introduce you to many of the hidden, and not so hidden, joys of Waco, via your mouth! We’ve compiled a list of just a few of the top places to eat at on your next trip down I-35. Whether it’s a quick pass through, or a weekend in Wacotown, we’ve got you covered. You won’t find tea at this place…except maybe some great sweet tea, as Jake’s takes you back to the 50’s at this southern diner style spot! As for the name? Texas Tea was a reference to crude oil back in the day, and Jake’s sits in a converted gas station. It’s kitschy and cute, and will surely fill your bellies with a menu filled with chicken fried steak, burgers and homemade pies! It’s the quintessential home-style cooking you expect to find in a small town in the middle of nowhere Texas. If there’s one thing from college I dream about most, it’s Lula Jane’s Mac n’ Cheese. This deliciously eclectic spot, located on Elm Street, is the definition of homegrown comfort. All of their baked goods are made-from-scratch (do yourself a favor and get the Pearl White Cake) and their daily lunch special is created from herbs and vegetables grown in the on-site garden. While hidden across the river and away from downtown, its well-worth the adventure. 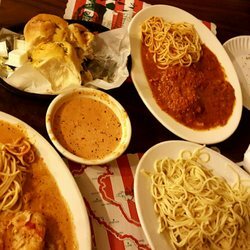 Among all of the good eats located in McClennan county (and trust me, my freshman 15 will tell you there are plenty), one reigns supreme: Baris Italian restaurant. Aside from the fact that you would swim in a bowl of their pink sauce, every single item on their menu is delicious. And don’t get us started on their warm, doughy, delectable rolls! P.S. it’s BYOB so don’t forget a bottle of wine! There are few things I love more than a good Irish pub. There’s just something about the rowdy crowds, dimly lit bar, and rows and rows of whiskey. In fact, one Waco bar – Barnett’s – was recently named the biggest whiskey bar in Texas. How’s that for a title? Barnett’s drink menu has something for everyone, and I mean everyone. From unique flavored bitters to fruity cocktails, Barnett’s has set the bar (ha) high for other Waco classics. Stop in for any of their exciting events including ugly Christmas sweater parties, Girl Scout Cookie pairings and St. Patty’s day celebrations. Since 1947, this drive-in spot has been serving up delicious burgers and tots. Don’t expect any glamour when you pull up…it’s not the “instagrammable” style nostalgia spot like Jake’s is, but Cupp’s is a beloved Waco institution, with fresh food made daily. But burgers aren’t all you’ll find. Go early and get a classic greasy “eggs, bacon and toast” breakfast!